Disc 1 contains the eight original pieces, which range from just under seven minutes to almost eighteen, sustaining an uplifting and positive mood throughout. Infectious rhythms and outstanding musicianship send much of this music skyward. I especially like “Dawn of Tao,” which feels much like a welcome break sitting in a patch of warm sunshine, listening to the birds and other nature sounds around you - calming, refreshing, and energizing all at the same time. I also really like “Om Shanti Shalom - Beatmix Instrumental,” with its powerful pulse and leisurely tempo. There are occasional wordless vocals on this one, too, but it’s mostly an easy groove that just feels good! Disc 2 has ten tracks that are radio edits and a bonus track that is the full “Pink Skies Suite.” In this group, the radio edits range from just over three minutes to six - still long enough to sustain a mood, but more radio-friendly. “The Bend” is not on Disc 1, but is included on Disc 2. In addition to “Dawn of Tao,” and “Om Shanti Shalom,” I really like like slow groove and soulful guitar of “Moving Glass” on this disc. If you are a looking for a bargain, you get a LOT of music for your money with this album - well over two hours! It is music with a purpose, but it is also a pleasure to listen to just for the music’s sake. 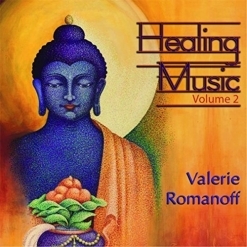 Healing Music, Volume 2 is available from Amazon, iTune and CD Baby. Check it out!